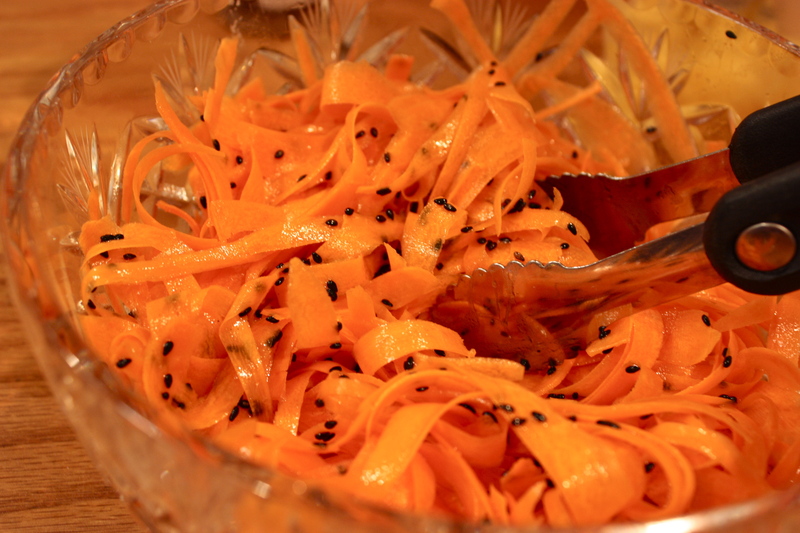 Carrot Curl Salad with Black Sesame Seeds | "Il faut goûter"
They sort of look like bugs. Dad bought himself a new truck, and I realized my family often celebrates with grilled hamburgers. Usually, there are homemade french fries. Tonight we passed on the fries (I think out of laziness). In a last-minute refusal not to have a fresh vegetable on our meaty plates, I began to make carrot curls. Once you peel away and discard the rough parts of the carrot, keep shaving the clean carrot flesh into little carrot ribbons. It makes for a very pleasing salad when you add a tangy vinaigrette. Crisp. Summery. Delightful. Black Sesame Seeds have a stronger toasty flavor than white ones, and they add a nice nuttiness to this salad. Some fresh parsley or cilantro would be a nice addition, but alas, it is not summer quite yet and the porch pots are empty. Throw this together some night, it’s tasty! This entry was posted in Savory and tagged carrot, Cooking, food, recipe, salad, vegetable by needtotaste. Bookmark the permalink. Me too, I adore raw carrots! Hope you love it! Nice salad have to try it! That looks like a delightful, if slightly infested, salad. Artful! The bugs taste so good. I like this. I tend to get in a carrot rut, and this is definitely a nice fresh recipe. Love that you used lime in the dressing, it goes so well with raw carrots.